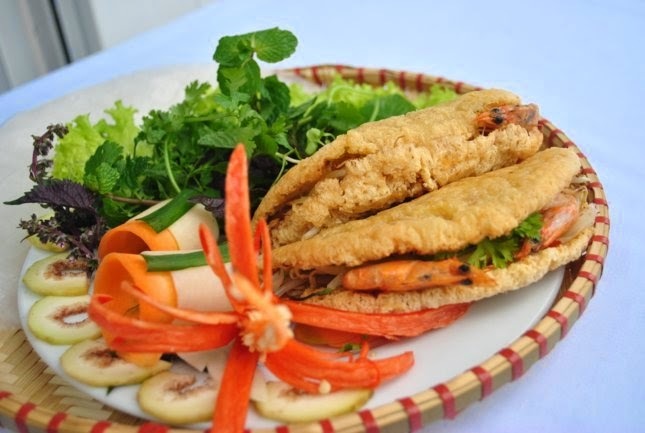 Khoái Cakes (Bánh Khoái) is one of most traditional Vietnamese Food Recipes in Middle Area. It looks like Bánh Xèo. However, their shapes are smaller and more filling inside. 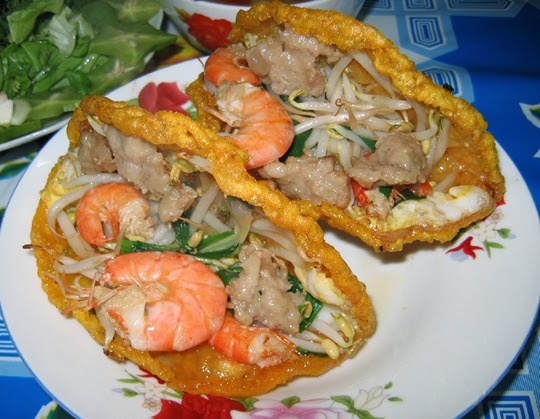 Vietnamese people always enjoy these cakes with vegetables and dipping sauce. All ingredients are not expensive, but it is required much time for cooking. Today, my mom decides to cook it so I try to type its recipe down and hope it can help who wants to cook at home like my mom. 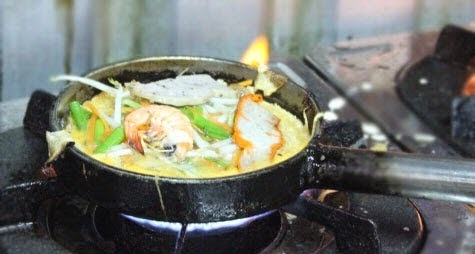 If you are gourmet, I think this dish is one of stunning Vietnamese Food Recipes you should not miss. When you want to cook, please follow our instructions below and let us start cooking right now. Fish sauce, pepper, salt, sugar, chili powder. Step 1: Mix rice flour with water with proportion 1:6. Stir well. Next, stir eggs with a little salt. Then, mix 2 these mixtures together. Step 2: Clean shrimp. Bring to steam. Then, peel off the cover and pull out the black lines on their backs. Step 3: Marinate sliced beef with pepper, salt and sugar. Wait in 30 minutes. Step 4: Marinate grinded pork with pepper, salt and sugar. Wait in 30 minutes. Step 5: Clean carefully bean sprout. Pick out the roots. Wait to dry. Step 6: Heat the oil. Scoop one spoon and pour into pan. Spread out thinly, wait in 2 – 3 minutes and add more filling: some shrimps, beef, grinded pork and bean sprout. Cover the pan and wait in 3 – 4 mintues. Next, open the lid, fold in half the cake. Do the same process until mixture in step 1 is out. 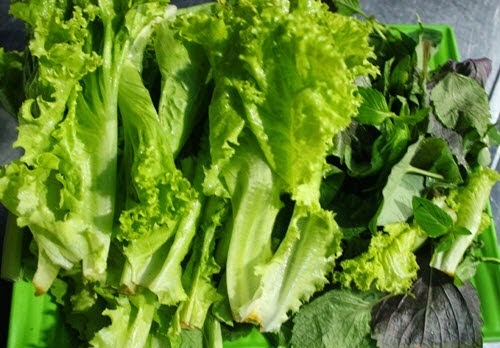 Here is also the important step to create flavor for one of stunning Vietnamese Food Recipes. The color of cake after frying has brown yellow and really crispy. - Mince well pork liver, marinate with a little pepper and salt. - Heat the oil, add more minced garlic and purple onion into pan, fry until they are fragrant. Next, add more soya sauce and water into pot with proportion 1:1. Then, pour minced pork liver and season with salt, sugar, fish sauce and a little pepper. Taste to suit your flavor. Then, add more grinded peanut and sesame. Turn off the heat. Finally, your delicious dish is ready to serve now. When serving, present with vegetables, sliced star fruit and sliced green banana fruit. 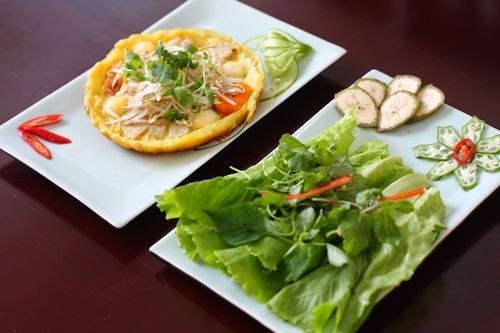 Using salad to cover Khoái Cakes with other vegetables is my habit. Eating with dipping sauce in step 7 will bring a strange and interesting flavor in your mouth and I bet you will not stop eating. 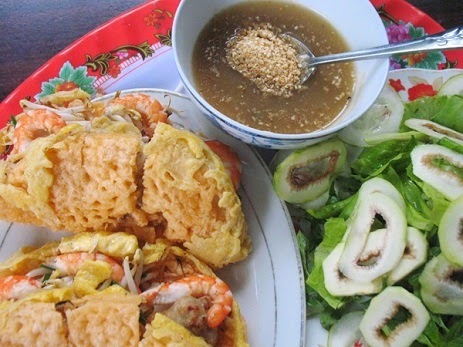 Hope you will make one of stunning Vietnaemse Food Recipes like this dish with us. Good Luck for your Cooking.